What Is Involved in Professional Cleanup After an Unattended Death? 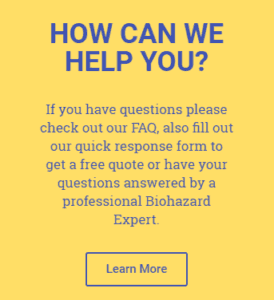 https://medtechcleaners.com/2018/10/what-are-the-most-common-bloodborne-pathogens/One of the biohazard and trauma cleanup services we offer is related to unattended death. This is a catch-all category, because it can include someone passing away from natural causes, a disease, criminal activity, or suicide. The common factor? The death occurred when no one was around to know it happened. This fact can create problems. The first to address may be the emotional trauma of the deceased’s friends or family. Suffering a death from the loss of a loved one is difficult, but when you are not present or not even aware it has occurred until afterward, the emotional impact can be even worse. So our first task when called upon to provide cleanup in the aftermath of an unattended death is for those living. Our trauma counselors first want to make sure that those left behind have the care and resources to process what has happened. Depending on a variety of elements, including temperature, a human body will begin to decompose somewhere between 24-72 hours. Decomposition is a natural process, but it can release toxins into the surrounding area. Decomposition is brought about by bacteria, and that is what produces the characteristic smell associated with a dead body. Some of that release can happen immediately upon death as bladder and bowel sphincter muscles cease working and urine and feces are released. Some deaths result in large amounts of blood. Bodily fluids can themselves be contaminated with toxins, but their very presence will attract other threats – insects, rodents, bacteria and more. Blood can be especially hazardous, because in addition to bacteria, blood may also be contaminated due to the health issues of the deceased (HIV, hepatitis, and more). Bodily fluids can seep into anything porous – carpeting, wood, bedding, mattresses, and more. Because of that, surface cleaning is not enough. Carpeting must be removed, and at times even the wood underfloor must be replaced. Some harmful bacteria can live for extended time periods in porous surfaces, and often the best way to get rid of the bacteria is to get rid of the material. Once the body is removed, we get to work to thoroughly clean, disinfect, and restore the property to a livable condition. Household cleaners are usually insufficient for this task, and that’s why we don’t recommend you attempt post-death cleanup yourself. Plus, there are regulations regarding the disposal of toxic waste (i.e., materials contaminated with bodily fluids) which the general public is most likely unaware of. Once we are satisfied that our remediation techs have cleared the area of biohazards (substances that are harmful to health), we move on to repair of any physical damage and restoration of the property. One further service we offer is that we work with any insurance company involved. And we will cover your deductible. Dealing with death is traumatic enough, so we do what we can to lessen the burden for you. And we will do so in a respectful and discreet manner, having compassion on those we serve. We understand that there is a need for this service, but we also realize those we serve are living, breathing, grieving human beings. We are here to help you through this difficult process. MedTech offers unattended death cleanup and other trauma-related remediation services in the Seattle and Spokane, Washington areas, as well as other communities in the Pacific Northwest. If we may be of assistance to you, please contact us via phone (877) 691-6706 or email medtechcleanersnow@gmail.com. Caring professionals are available by phone or Email 24 hours day. MedTech Cleaners works together as a team with Pacific Northwest Hoarding & Affordable Biohazard to serve you.